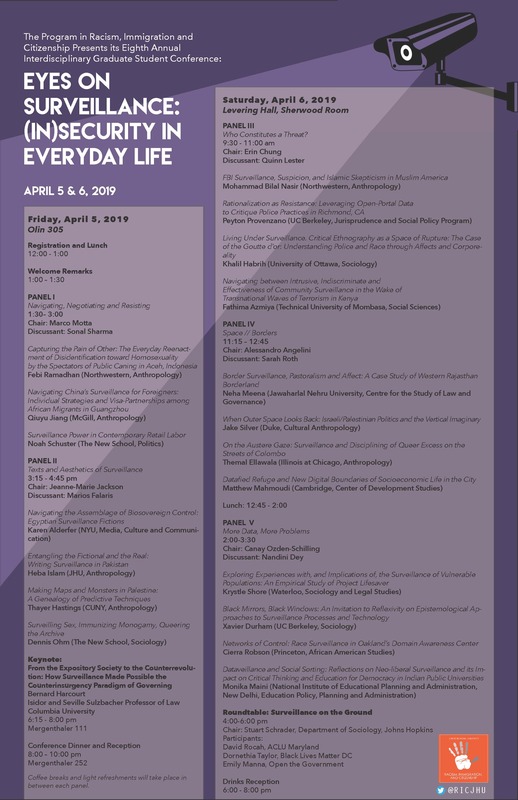 Please join us for the 8th Annual JHU RIC Conference “Eyes on Surveillance: (In)security in Everyday Life” on April 5-6, 2019. This year’s conference interrogates the normalization of surveillance in our everyday life. 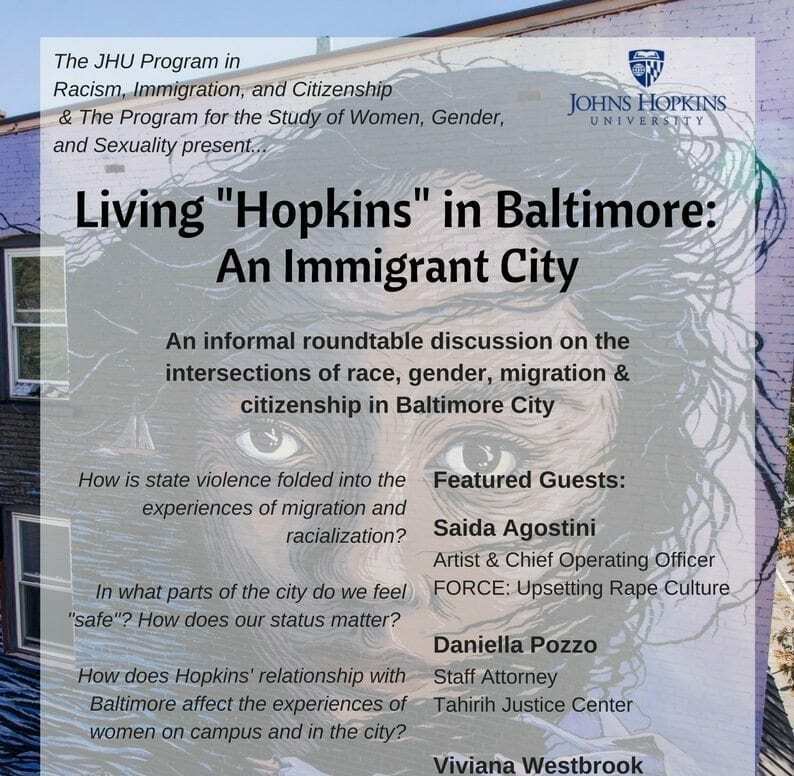 Going beyond “surveillance” as a buzzword, the conference will present interdisciplinary research that considers what might constitute the monitoring of bodies and actions across a variety of lived experience. 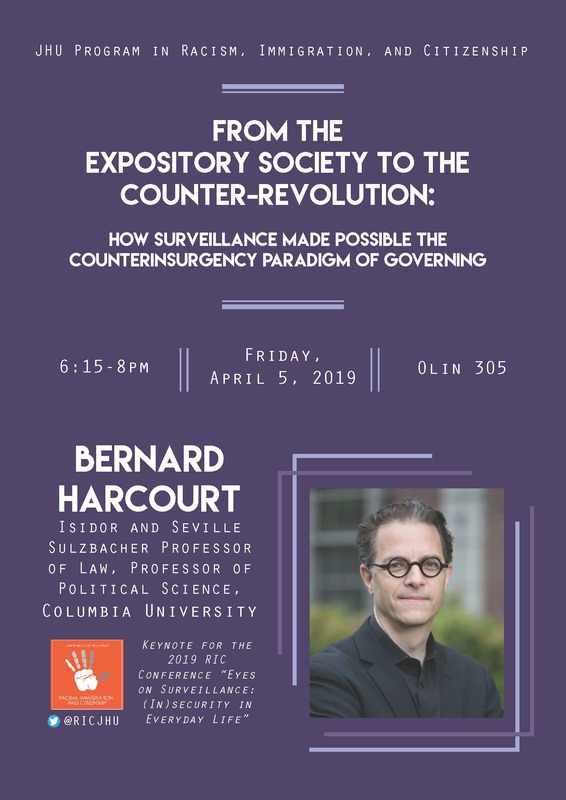 Join us for the 2019 RIC Conference keynote address by Bernard Harcourt on Friday, April 5 from 6:15-8 p.m. in Mergenthaler 111. Bernard E. Harcourt is the Isidor and Seville Sulzbacher Professor of Law, Professor of Political Science, Executive Director of the Eric H. Holder Initiative for Civil and Political Rights, and Founding Director of the Columbia Center for Contemporary Critical Thought at Columbia University. His scholarship intersects social and political theory, the sociology of punishment, and penal law and procedure. 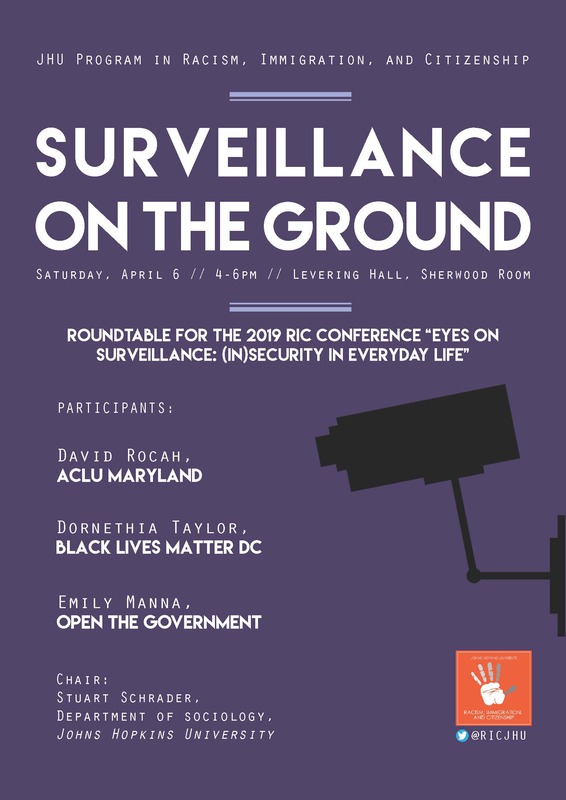 Please join us for this roundtable discussing ‘Surveillance on the Ground’ as part of the 8th Annual RIC Conference “Eyes on Surveillance: (In)security in Everyday Life” on Saturday, April 6 from 4-6 p.m. in Sherwood Room, Levering Hall.This roundtable brings together Dornethia Taylor from Black Lives Matter DC, David Rocah from the ACLU, and Emily Manna from Open the Government to speak about their work on surveillance and how surveillance affects their professions. Lesley Ann Brown presents, “Decolonial Daughter: Letters from a Black Woman to Her European Son” on Tuesday, April 2, from 3-5 p.m. in Mergenthaler 266. 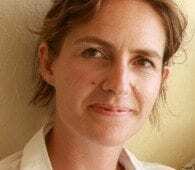 A Trinidadian-American writer and activist explores motherhood, migration, identity, nationhood, and how it relates to land, imprisonment, and genocide for black and indigenous peoples. 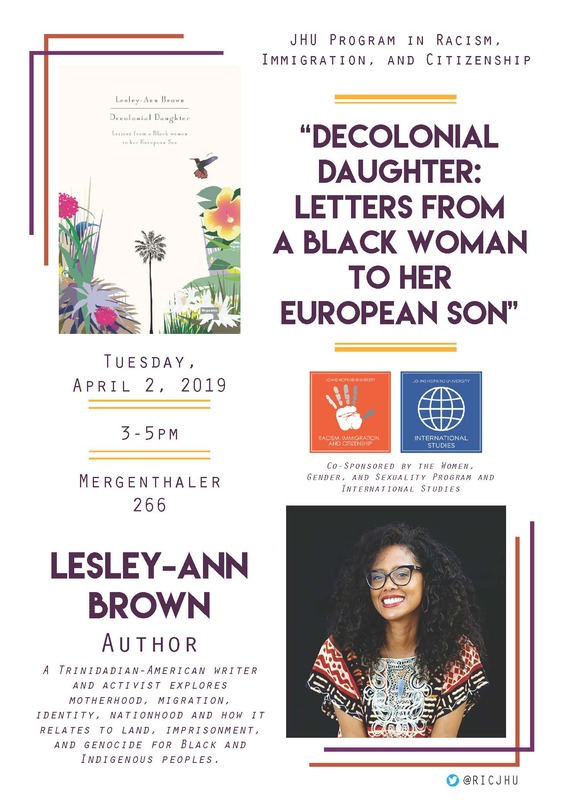 On Tuesday, April 2, from 3-5 p.m. in Mergenthaler 266, author Lesley-Ann Brown will present, “Decolonial Daughter: Letters from a Black Woman to her European Son.” A Trinidadian-American writer and activist, Brown explores motherhood, migration, identity, nationhood, and how it relates to land, imprisonment, and genocide for black and indigenous peoples. Please join us for our first event of the 2019 Spring Semester. 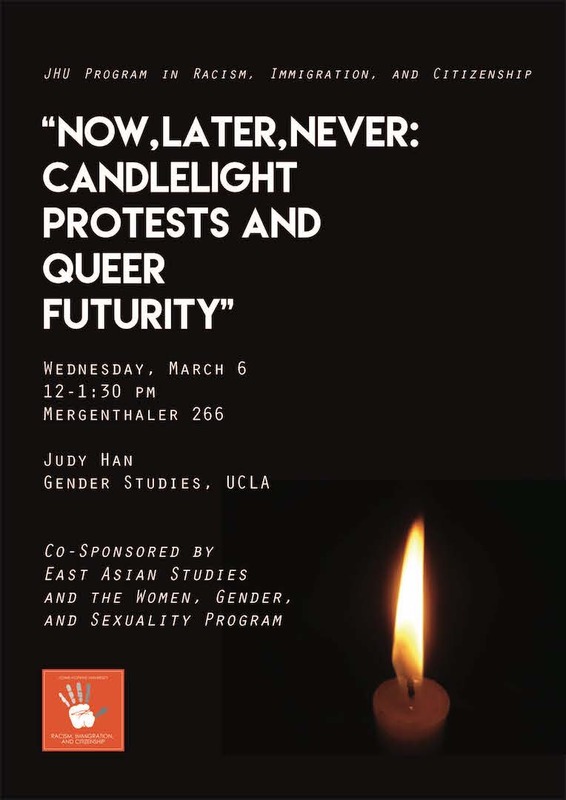 Judy Han (assistant professor, gender studies, UCLA) will give a talk on “Now, Later, Never: Candlelight Protests and Queer Futurity” on Wednesday, March 6 from noon-1:30 p.m. in Mergenthaler 266. 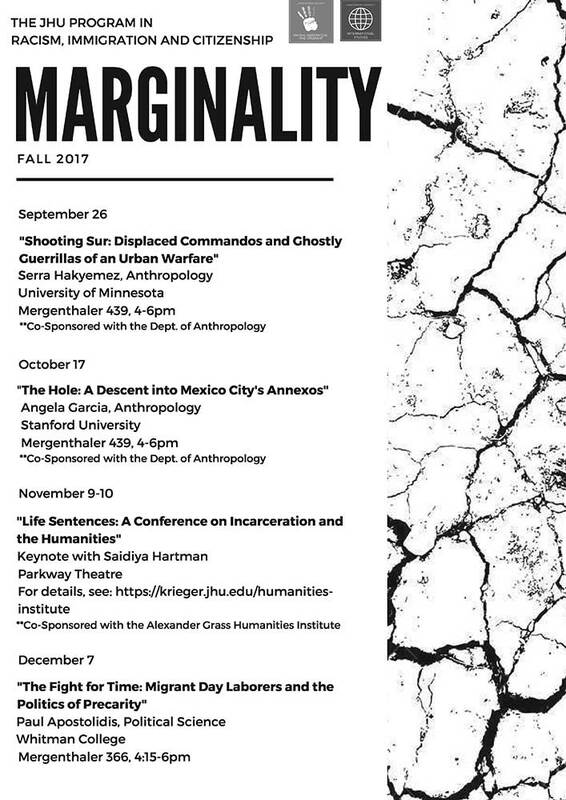 Join the Program in Racism, Immigration, and Citizenship for its Fall 2017 Speaker Series, “Marginality.” Events run from Sept. 26 to Dec. 7 and “Life Sentences: A Conference on Incarceration and the Humanities” with keynote speaker Saidiya Hartman. 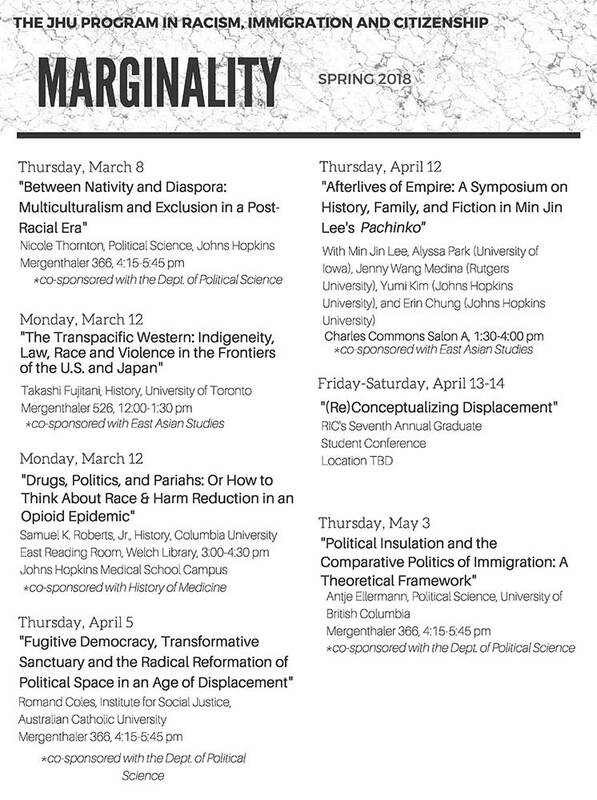 Tuesday, April 25, 4-6pm, Mergenthaler 426 “Stranger friendships: Solidarity and subterfuge in the Palestinian camps in Lebanon” Diana Allan McGill University Download a PDF version of the poster here.